These adorable patriotic picnic birthday invitations are great for summer birthdays and perfect for parties held during patriotic holidays like Memorial Day or the 4th of July. There are two designs one for girls and the other for boys. 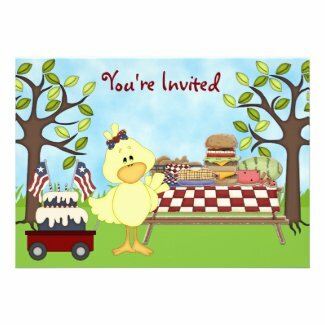 They each feature a cute yellow bird, birthday cake, picnic table, lots of food and flags. Each invitation can be personalized with a name and party details. Select the invites to view additional info and edit. For more Independence Day Invites take a look at the page 4th of July Birthday Invitations. Take a look at the site 4th of July Party Supplies for a few matching party supplies. You will find a great selection of decorations, favors, tableware and other patriotic themed supplies.